Concrete Polishing & Restoration | All Building Cleaning Corp. Concrete Polishing & Restoration | All Building Cleaning Corp. Cleaning concrete floors is something many people probably don’t think about unless they have concrete floors at their business or home. But there is definitely a need for cleaning them and we know how to do it. First off, concrete floors stain. Whether it is a driveway, basement or an industrial floor there will be spills – oil, paint, grease, etc. And sometimes the concrete surface is painted. There are also other variables including sealing, cleaning polished concrete and getting rid of rust. Polished concrete floors are often used in retail establishments, hotels and museums, just to name a few. And those require standard maintenance to maintain their beauty. We can clean your concrete and we will tell you how. Concrete flooring is a popular material for hard-working commercial areas such as garages and warehouses. It is durable and easy to maintain, for the most part. But it still needs cleaning if you want it to look nice. 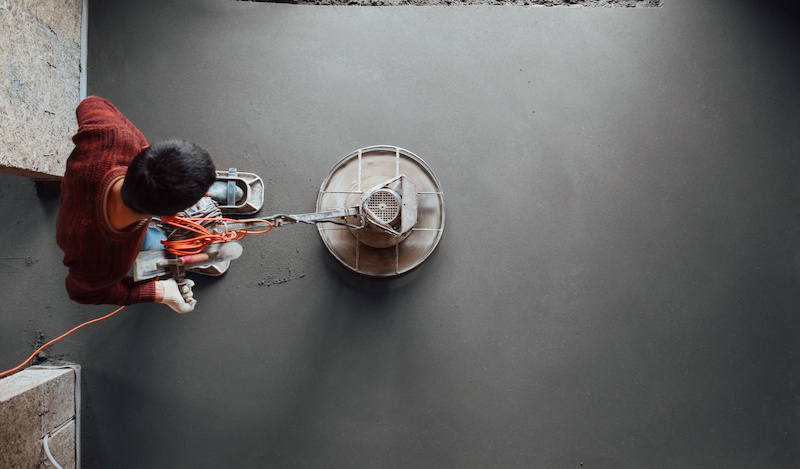 Concrete floors need to be sealed or waxed every 3-9 months depending on the level of traffic in order to maintain the protective layer over its surface. Other than a neutral cleaning agent to mop the floor clean periodically. Depending on the need, there are grinders and polishers, as well as solvents and degreasers. Water-based, biodegradable Fabulene penetrates, emulsifies and absorbs the toughest grease, oil, carbon, ink, gum, wax, dye organic debris and industrial grime. Some good cleaners include Castile soap, liquid dish detergent, stone cleaners and mild floor cleaners. We can mix a solution, apply it to the floor with a wet mop and then rinse with a mop dipped in clean water. To make your concrete floors resistant to future stains, we can apply a concrete sealant. Although polished concrete floors are extremely durable through the densification and polishing process, they will eventually lose their beautiful shine if not properly maintained, especially if they are located in high-traffic commercial or retail facilities. The good news is that while polished concrete floors are not maintenance-free, they generally are easier to maintain than other types of decorative concrete floors, since they require no waxing or sealers. Routine maintenance for polished floors consists of daily dust mopping to remove dirt and grime accumulation that can abrade the surface of polished concrete. Frequent wet mopping is also needed. Although only clean water can be used, Greater success comes with using a floor cleaner to suspend the dirt particles so they can be more easily removed. Painted concrete floors are not much harder to clean than other types of flooring, but do require different cleaning agents. As a cleaning company, we know how to treat each unique situation and surface. Our professionals are highly trained in the treatment of all flooring surfaces so you are in good hands. If you need regular concrete floor maintenance or you have a bigger job just contact us for a consultation.